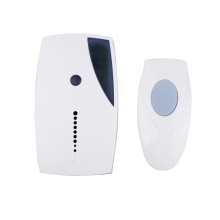 *Wireless digital door bell:Simple,vivid and no-wire installation design avoid troubles and save money when in installation and don&apos;t effect decorate environment. *36 melodies for selection,you can select your favorite as you wish.LED indicators: Press the launch button to turn on the transmitter LED indicator light and the transmitter. The receiver receives instructions, and delivers pleasant music to remind you that a guest is coming. In the meanwhile, the "blue" LED light will regularly flicker along with the music. *Remote control range up to approach 70-110 meters/230ft-360ft in open air,ultra long distance and stable signal. *Low power design,strong penetration ability,no wiring required and easy for installation(with double-side stickers at the back of the remote button). *Wide usage scopes especially suitable for homes,offices,factories,hotels, etc.